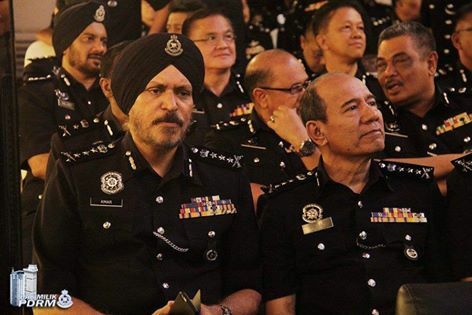 KUALA LUMPUR, Malaysia—It will be a proud moment for the Sikh community who are known for their fearlessness and military prowess when new Kuala Lumpur police chief Commissioner Datuk Amar Singh Ishar Singh (pix) takes over as the city’s top cop tomorrow. His forefathers would be pleased to see the third generation cop – his father and grandfather were also cops during British rule – rise to assume his new post as the first Sikh to achieve the highest rank of commissioner. Amar, who was former Kuala Lumpur deputy police chief for several years before being promoted and transferred to Bukit Aman as deputy CID director, returns tomorrow to lead his personnel in grounds he is familiar with. “It sure is an advantage in executing my duties as just years ago I was deputy police chief in KL and am familiar with things here. My vision is to ‘go back to the basics’ in policing. Undoubtedly, modern technology is nice to have and has helped in solving crimes but nothing beats the rules of basic policing such as quality investigations. “My vision is also to have a service orientated metropolitan force with high work ethics with ‘no wrong door’ system. The public will be served and should not be given the runaround,” he told theSun. Amar, who is a qualified lawyer and has a string of academic degrees in various disciplines including Islamic and Syariah Law, said he was grateful to Inspector-General of Police Tan Sri Khalid Abu Bakar for the promotion. “The IGP had said in the past that the police force is colour-blind when executing its duties. I wish to add that he has also proven that the rule also applies to promotions in the force. “Being an Indian, I am promoted and this is proof that there is a bright future for the non-Bumiputera in the police and it is possible for them to grow in rank if they are tenacious to work ethics,” he said. Before Amar, the highest ranking Sikh police officer was Datuk Santokh Singh who held the rank of assistant commissioner and was Selangor police chief decades ago. Amar, who is known to be an approachable but no-nonsense officer, will attend an official handover of duties ceremony at 7.30am at the Kuala Lumpur police headquarters tomorrow.